Friday is World AIDS Day, a chance for the Emory community to join people worldwide in the fight against HIV, showing support for people living with HIV and honoring those who’ve died from AIDS-related illnesses. Founded in 1988, World AIDS Day is considered the first-ever global health day. 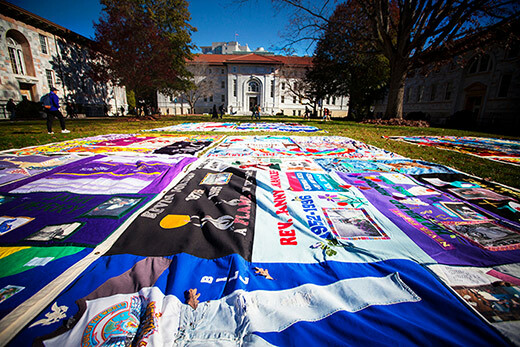 And for more than a decade, Emory has marked the occasion with the annual Quilt on the Quad, the nation’s largest collegiate display of AIDS Memorial Quilt panels. This year, the event has been previewed with 17 colorful quilts, which have been displayed inside buildings throughout campus to help build public interest, says Jon Giuliano, an Emory College student and president of Emory’s Quilt on the Quad event. On Friday, approximately 1,000 of the panels will carpet the Emory Quadrangle from 9 a.m. to 5 p.m. in a dramatic presentation intended to deliberately engage onlookers, Giuliano says. A public fair featuring community partners and student clubs will be held on the quad between 11 a.m. and 2 p.m. Toward the end of that celebration, the names of people memorialized on the quilts will be read out loud, Giuliano says. In the event of rain, the quilt display and related activities will move to the Woodruff Health Sciences auditorium. This year’s 13th annual Quilt on the Quad event is sponsored by Emory Hillel and the Emory Center for AIDS Research (CFAR) a research center funded by the NIH since that strives to reduce the incidence of HIV and develop a vaccine and cure for HIV through trans-disciplinary research. Additional CFAR funding is provided by the Georgia Research Alliance and multiple Emory offices, schools and centers. To view an infographic about 20 years of groundbreaking HIV/AIDS research at Emory, click here. The NAMES Project AIDS Memorial Quilt was founded in 1987 in San Francisco. Now headquartered in Atlanta, it comprises nearly 49,000 panels bearing the names of more than 96,000 individuals. From its inception, the goal of the project has been to create an ongoing memorial for those who’ve died of AIDS-related causes and to help people understand the devastating impact of the disease. The panels that will be on display at Emory are components of the original project, notes Giuliano. “A lot of them are from the late '80s and early '90s — many created by the families to honor friends and loved ones, which is very moving,” he says. For those who’ve never experienced the quilt display, “it can be a little daunting, because it covers the entire quad,” Giuliano says. But that tapestry offers an important visual reminder of past human struggles. It wasn’t that long ago that a diagnosis of HIV/AIDS was a death sentence. “Now, we’ve developed treatments that are effective in helping people lead longer, healthier lives. In the early days of the epidemic, those treatments didn’t exist,” he says. Given Emory’s longstanding role in the fight against HIV/AIDS, it’s especially fitting that the campus hosts this event, Giuliano adds. From the earliest days of the epidemic, Emory physicians, scientists and educators have played a pivotal role. From inventing some of the most successful drugs to battle the virus to developing and testing promising vaccines, from conducting clinical drug trials and leading behavioral and prevention research to treating and counseling thousands of patients, Emory has been recognized as a local, national and international leader. In fact, Emory researchers developed HIV/AIDS drugs now used by more than 94 percent of U.S. patients and thousands more globally. In addition to the Center for AIDS Research, the Emory Vaccine Center’s Hope Clinic continues to be a national leader in conducting clinical trials for HIV vaccines. Over the last decade there have been significant advances in addressing the epidemic, with a 45 percent decline in AIDS-related deaths recorded since a peak in 2005 and a 35 percent decrease in new HIV infections, according to the Centers for Disease Control and Prevention (CDC) and the World Health Organization. Yet the epidemic is far from over. More than 1.1 million people in the U.S. are living with HIV today; 1 in 7 of them don’t know it. In the U.S., rates of HIV and AIDS diagnoses are highest in the South. Overall, annual HIV infections and diagnoses are declining in the United States — possibly due to targeted HIV prevention efforts. However, progress has been uneven, and annual infections and diagnoses have increased among a few groups. Worldwide, approximately 36.7 million people were living with HIV/AIDS at the end of 2016. Of these, 2.1 million were children under the age of 15. Only 60 percent of people with HIV know their status. The remaining 40 percent (over 14 million people) still need to access HIV testing services. As of July 2017, 20.9 million people living with HIV were accessing antiretroviral therapy globally, up from 15.8 million in June 2015, 7.5 million in 2010, and less than one million in 2000. 1 million people died from AIDS-related illnesses in 2016, bringing the total number of people who have died from AIDS-related illnesses since the start of the epidemic to 35.0 million.